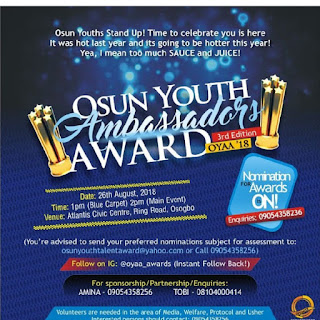 Osun Youth Ambassador Award (OYAA) has kick-started with a call to interested members of the public to forward their nominees for necessary scrutiny and screening. 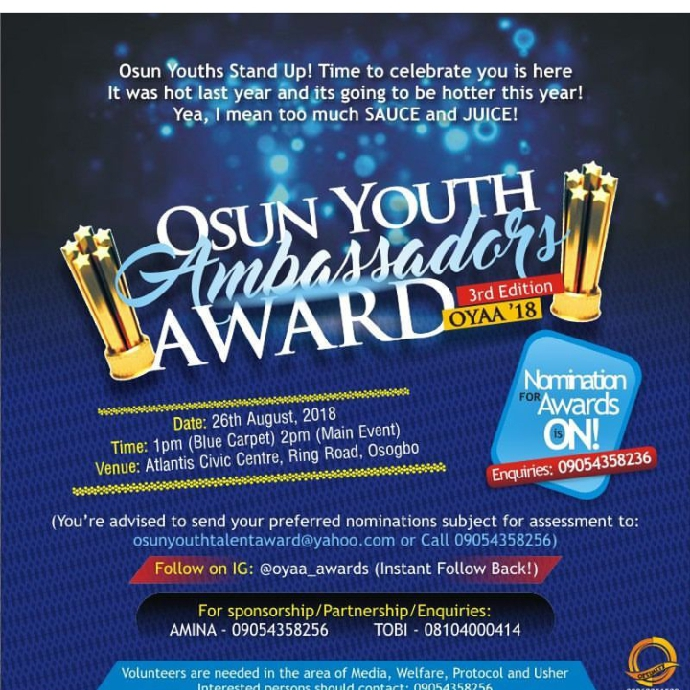 The third series of the award under the auspices of Youth Reformer Initiative was born out of the quest to celebrate the dignified Youth of Osun origin who have excelled in their chosen professions. The award is also to inspire recipients to strive harder for more greater success in life. A release by the organiser revealed that the first edition was held at Osogbo City Hall where 15 excellent youths were celebrated while the 2nd edition held last year at Atlantis Civic Center Osogbo which had 20 outstanding youths honoured through fair nomination process. Meanwhile, this year's edition would hold in August 26 with another round of amazing Youths to be celebrated. The nomination process is now open for the award of excellence in the following categories; Agriculture, Entrepreneurship, Health, Sport, Force, Gender Advocacy, Private Sector, Education, Religion, Environment, International Partnership, Peace Building and Science & technology. 1) Such recipient nominee must be an indigene of Osun state. 2) Must be an undergraduate or graduate of an higher institution. 3) Must have embarked on a project that would yield large benefits to the world, Nigeria and especially Osun state. The nomination process for this year edition is still on while the event is set to come up on August 26 at Atlantis Civic center Osogbo."